One way to make any dish more appealing is to take the same ingredients and serve them in a whole new way. 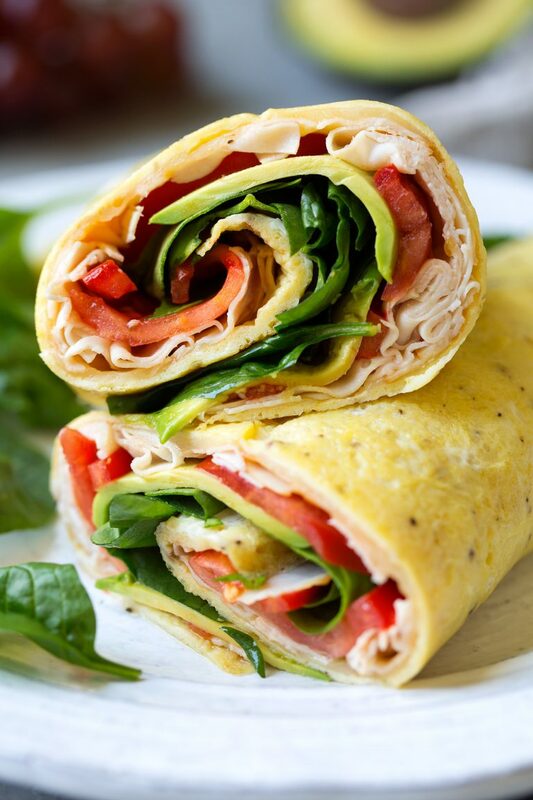 Egg Wraps are not only very versatile, providing endless options, but they are also fun. They are very easy to make, and we provide a link to a great video to make it even easier. Use one egg to make each wrap, so that it is easier to handle in the pan. Then you are able to add other proteins for variety – like Applegate farms turkey or chicken sausage, Applegate Farms turkey bacon, Applegate Farms or Boar’s Head sliced deli turkey or any other combo you enjoy. If you are on maintenance, raw or organic cheese can also be a great option. One serving is approx. 20g of protein (one egg is 6g). Add sliced avocado for fat or sliced tomato or sautéed veggies for variety. Whisk the egg in a bowl until egg yolk and whites are well-blended. On medium-high heat, place enough oil in a non-stick, ceramic pan to coat the bottom. Pour egg mixture into the pan, rotating the pan to allow the mixture to spread evenly into a thin layer. The thinner, the better. After one side is cooked, flip the egg over, cooking just until done. Remove the egg wrap and place on a plate to cool. Place your choice of fillings and roll up.